Masking tape may seem like a generic, all-purpose tape type, but there are several varieties with significant differences. All masking tape is designed for temporary use. It covers areas you don't want painted or otherwise altered as you work on nearby areas. 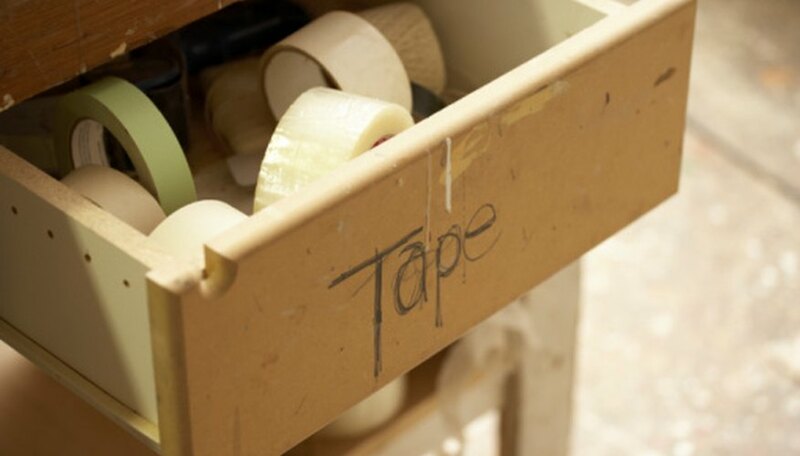 The main difference between types is the "tack," or how sticky the tape is on specific surfaces, making it easier or more difficult to remove. Painter's masking tape is a low-tack tape designed to work on painted drywall. When used properly, it blocks paint from flowing into unwanted areas, yet removes easily without damaging dry paint beneath it. Painter's tape is often blue or green, making it easy to identify. Remove painter's tape as soon as possible after painting, and always within 12 hour of applying it for best results. Leaving it on longer may allow it to bond to the surface, especially in warm conditions. The tape may peel up some dried paint with it or leave a sticky residue if this happens. Masking tape designed for all-around use has a higher tack level than painter's tape, increasing the risk of marring surfaces or leaving residue when you remove it. This tape works best on smooth, non-porous surfaces like plastic or metal. Frequently, the cheaper the tape, the higher the tack, making the cheapest tapes best for craft projects such as patching holes in paper-mache. This type of masking tape is generally an off-white, tan or slightly yellow color. For best results, remove this tape within four hours of masking. This tape is extremely low-tack, designed for easy removal from paper. Draftspersons use this type of masking tape to hold vellum, a semi-transparent paper, in place over architectural blueprints. The vellum lets the drafter draw a new layer over the original drawing, such as one showing electrical circuit pathways. This requires precise alignment over the original drawing, so the tape must hold firmly, yet remove easily without tearing the delicate paper. Artists use this tape on paper or, more rarely, canvas, to control the flow of paint, charcoal or other media over their work. The tape must not mar any completed art beneath it or tear the paper when removed. This tape is usually white, and should be removed immediately after use. Masking tapes of all kinds come in a variety of sizes, and the colors noted as most common for each type are not the only ones available. Common sizes range between 1/2 and 2 inches wide, but narrower and wider specialty tapes are available. Within each type, each manufacturer has its own adhesive formula. Read the packaging before purchasing a tape to find out its strengths and the recommended removal time. Anne Hirsh has been writing and editing for over 10 years. She has hands-on experience in cooking, visual arts and theater as well as writing experience covering wellness and animal-related topics. She also has extensive research experience in marketing, small business, Web development and SEO. Hirsh has a bachelor's degree in technical theater and English and post-baccalaureate training in writing and computer software. What Is Washable Tempera Paint?